On March 30th – 31st, 2019, a delegation of the Interreligious Working Group for Rendering Aid to the Population of Syria of the Council for Cooperation with Religious Associations under the President of the Russian Federation visited Damascus. The visit was aimed at delivering one more consignment of humanitarian aid to the Syrians and at launching a project to restore the infrastructure in Syria, destroyed by the war. These projects are being implemented via the Interreligious Foundation for Implementing Joint Humanitarian Projects, established in 2017. The delegation included Hieromonk Stefan (Igumnov), head of the Working Group, secretary for inter-Christian relations of the Moscow Patriarchate’s Department for External Church Relations; Mufti Albir Krganov, chairman of the Spiritual Assembly of Muslims of Russia; Mr. Salikh Khazrat Ibragimov, Imam Muhtasib of the Nizhnekamsk district of the Muslim Spiritual Board of the Republic of Tatarstan; Bishop Dmitry Shatrov of the Russian Union of Christians of Evangelical Faith for St. Petersburg and the Leningrad Region; Mr. Sergei Baydakov, chairman of the Moscow Branch of the Imperial Orthodox Palestine Society; Mr. Islam Khazrat Valitov, Imam Khatib of the Spiritual Assembly of Muslims of Russia; and Mr. Hassan Nasrallah, chairman of the Arab Diaspora Regional Non-Governmental Organization. In the morning of March 30th, the delegation from Russia arrived at the Holy Cross Church of the Orthodox Church of Antioch in Damascus, where they were greeted on behalf of His Beatitude Patriarch John X of Antioch and All the East by Archimandrite Alexis (Chehadeh), director of the Department of Ecumenical Relations and Development. 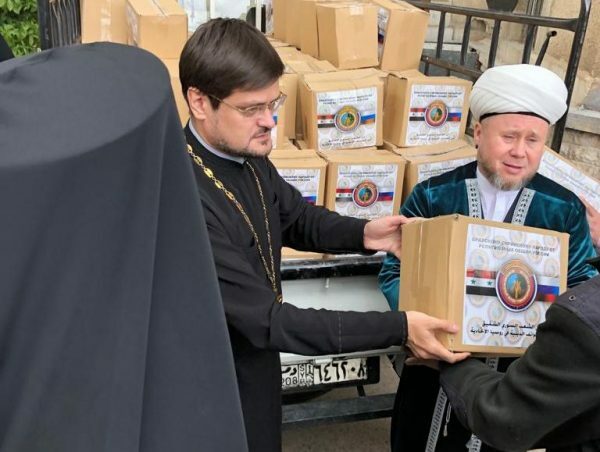 In the church yard, with the participation of representatives of major Christian and Muslim communities of Syria, a thousand boxes containing high-quality humanitarian aid for the needy Syrians were distributed. Aid funds were raised thanks to donations from the Russian believers, both Christians and Muslims. A substantial contribution was made by the Imperial Orthodox Palestine Society, whose representative is a permanent member of the Working Group. When the aid was distributed, a Russian-Syrian interreligious round table meeting took place at a parish building of the Holy Cross Church. Such round tables are traditionally held on the days when the Working Group carries out its humanitarian actions. Representing the Syrian side at the meeting were Sheikh Bashir Eid al-Bari, Grand Mufti of Damascus; Sheikh Adnan Al Afyouni, Mufti of the Damascus Governorate; Sheikh Hassan Nasrullah, head of the Damascus Department of Awqaf; and other representatives of the Islamic clergy; as well as Bishop Armash (Nalbandian), Primate of the Damascus diocese of the Armenian Apostolic Church; Archimandrite Alexis (Chehadeh), director of the Antiochian Patriarchate’s Department of Ecumenical Relations and Development; Pastor Boutros Zaour, rector of the Evangelical parish of Damascus; and hierarchs and clerics of the Melkite, Maronite and Armenian Catholic Churches. The participants in the meeting discussed various issues pertaining to the development of current humanitarian projects in Syria. The representatives of the Syrian side expressed their gratitude to the Russian believers for rendering aid to the population of Syria on a regular basis. Special gratitude was conveyed to His Holiness Patriarch Kirill of Moscow and All Russia as the initiator of these projects. The participants in the meeting also noted an importance of the visit to Damascus in November 2018 of Metropolitan Hilarion of Volokolamsk, chairman of the Moscow Patriarchate’s Department for External Church Relations, who is personally in charge of the interreligious humanitarian projects, as well as the importance of the interreligious conference that was held in Damascus at the time of Metropolitan Hilarion’s visit and laid the foundation for further joint work. The representatives of the Russian and Syrian Christian and Muslim communities outlined their plans for 2019, such as a delivery of several more consignments of humanitarian aid and restoration of the Syrian schools.